OK - so if you haven't noticed, interactive white boards seem to be the latest craze in public schools - at least they are in my neck of the woods. I have had the luxury of installing about 3 dozen SMART Boards and about a dozen Prometheans. I have even went through training to become a certified Promethean trainer. I have also used some other popular units in the past but please know that I am not here to advocate for any particular brand. I am here to speak about how they are being used. This is a student tool not a teacher tool. Over the last several years I have watched excitement grow over the interactive white board (IWB) - and with good reason. The IWB is an awesome tool to have at one's disposal. Any brand, while different in construction, design, and software basically affords the same general possibilities for interaction with your students. Most of the vendors will even tell you that you can use other IWB software with their system (if appropriately licensed, of course) All this aside, the key word in the name of this tool is INTERACTIVE. Unfortunately, I have watched way too many teachers use this tool as a glorified projection screen or PowerPoint clicker. The IWB should be used to engage your students so, teachers, I urge you to take advantage of the power of your technology. Design lessons that bring students to the board. Add some kinesthetic learning to your routine. Have students construct sentences, build molecules, or count change by manipulating objects on the board. Find what works at your level and content area and get them out of their seats. Record the session. Some teachers may not know that they can record what happens on the board. Get a wireless microphone (it is cheaper than the IWB setup you have...) and start archiving what you and the students do at the board. Combine this with the internet, and I would recommend, a CMS like Moodle and you have a great way to retain activities and make them available for absent students or those that need to review. Take time to learn the features of your software. Invest your time. Don't use the "I don't have time excuse" - make time. If you want to excel at what you do, you need to be willing to go the extra mile. Attend trainings and create engaging, student-centered lessons after hours if you have to. Be creative with the tools. Revealers, spotlights, layers, quizzing and polling, graphic libraries, magic ink, screen capture, duplication, transformation, opacity, animations, and so much more can all be harnessed to excite your students. I bet your students could probably help come up with some great ideas. In fact, I will go so far as to say that if you had them creating some of the lessons as an activity, not only do you save some of that time but you might even help some of your students reach higher levels of Bloom's Taxonomy with your content area at the same time. An interactive white board is capable of so much more than just displaying what is on your computer desktop and advancing PowerPoint slides. Please, I beg of you, do not insult the wonderful technology you have by reducing it to performing such mundane tasks. Get beyond the PowerPoint and start really using the tools in a more meaningful way. Don't your students deserve better? Day three started off with some nicely fresh cooked omelets to order. The cooks were proficient at flipping the fixins around in the pan. It was fun to watch. My first session was on managing netbooks and laptops with Linux but I changed it since I did not want a repeat of the same material that I got twice the day before. I went into a session on Community Area Networks instead. It was not really something for me at this time though so it was a loss anyway. The second session of the day was on Google Apps, Linux, and Open Source in an Economic Downturn. This was the best session of the conference, at least for me. There was a lot of great Q&A that took place and I felt as though I actually got some things that I can take back and consider or try out from this session. My third session of the day was on mobility for the end user in a 21st century classroom. This was an OK session but there was not a whole lot that I was able to take away from this. Finally, after lunch, my last session was on migration to Open Office. It was nice to hear about some of the roadblocks that were encountered by other districts and how they dealt with them. After it was all over, another 5.5 hours in the car back home was on the schedule. So this was my first BrainStorm conference. Ultimately, I did not really get out of it what I was expecting. I did not go to "get sold" on something but to get educated on things. I really wanted to learn some stuff about Linux but mostly got some sales pitches about how someone else could do it all for me. Perhaps I simply did not pick the right sessions. Next time maybe I will be a bit more savvy about how to choose the sessions that are less sales pitch and more professional development. I was pleased enough to desire a trip to BrainStorm again next year. I recently came across a web based, PowerPoint-like application called 280 Slides - created by 280 North. I thought it might be nice to do a small review of the application based on my first impressions. On the home page, the big button that says "TRY IT NOW, FREE!" truly delivers. You do not even have to register or anything - just start creating. I found out, however, that you will need to register if you want to upload pictures. It was a very simple registration, though. In fact, it was probably one of the easiest I have done. Just an e-mail and type password twice - no need to even do the confirmation e-mail thing. I liked how easy it was to get going with the application. If you are a Mac person and are familiar with Keynote - you should feel comfortable with this. It had very much and 'Apple' feel to it. Apparently two of the creators were Apple employees though. If you are more of a PowerPoint user, this is no problem. I felt this application had a very small learning curve. The user interface was very simple to understand without tons of buried menu items. OK, so I by no means did an extensive review but there were some things that stood out right away. I liked that the UI was easy to grasp with friendly icons. Since there was no installation of any kind, startup was fast - no waiting for the program to load. In a hurry? This might be your ticket. The registration was even fast and hassle-free. The media support is pretty good with the ability to upload pictures and videos along with some simple built-in shapes. I thought the opacity slider was a neat feature. Sharing via blogs and such is simple too. You can get the embed codes needed with a few quick clicks. OK, again, not an extensive review but there were a few things that I identified as drawbacks. First, there are only nine these to pick from and five of those are just solid colors and pretty boring. Three of the other four are OK but not stellar and the graph paper theme might be OK for some math lesson but careful on the eyes with that one... Second, and this may not be that big a deal - there were only three layouts to choose from but then again, how many do you really need? You can place things wherever you want anyway. Third is the big one in my book. I did not notice a way to create hyperlinks. Since this is web-based, there seems a strong chance to want to link to something on the web from your presentation. Ultimately there is not a lot of capabilities with the product but it does what it needs to for the most part. Overall, I thought this was well made - attractive and functional. I am not sure how much demand there is for a product like this with PowerPoint, Keynote, GoogleDocs, and OpenOffice Impress out there especially when GoogleDocs and Impress are free and have much more functionality. I can see, however, in a pinch when you might be limited to someone else's computer or something and your favorite resources might not be available that this would be a good place to go. Here is the sample presentation I created - it was very easy and sharing is a breeze. Please note that this walk-thru was created with a 1.9 version of Moodle. Newer versions may not look the same. Ok - I thought that I would make a blog post on this one since it is a question that is often asked by teachers using Moodle. "Can Moodle show me the new posts so I don't have to filter through them all and try to remember which ones I have not read yet?" The short answer to this is YES! Woot! Here is the long answer...which includes the answer to the follow up question of HOW? By default, this feature is not turned on. Each individual has to activate the setting in their profile in order to be able to see the tracking. Also, please note that whoever created the forum needs to also make the tracking available on that forum so even though you have it set to track unread posts in your profile you may not be able to see them if the tracking on a particular forum is turned off. Here are some visual steps to being able to see the forum tracking. I realize that there are many paths that one could follow to accomplish this task. This is just one of the options that can help you to achieve this result. 1. Start by clicking on the forum you want to adjust the settings for. 2. Then you want to choose Update this Forum. This button can be found towards the upper right of the page. 3. You should find a setting called 'Read tracking for this forum?' By default it is set to optional which means that students can adjust settings for that forum individually if they don't want tracking for that particular forum. If set to yes or no - tracking on the forum cannot be chosen by the student. 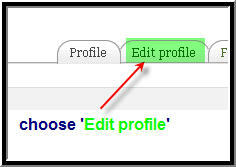 Since the default is set to 'optional', tracking will be enabled if it is turned on in the student's profile. This button can be found at the bottom of the screen. 4. 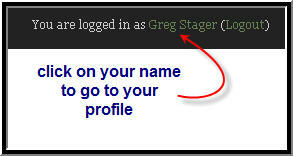 The next step is to click on your name in the upper right corner. This should take you to your profile. Once we get there, we will need to edit your profile. 6. The setting we need to adjust is not readily visible so you need to click on the 'Show Advanced' button. This will bring up some more options. 7. This is the one we want to change. Remember, you are updating your own profile. All students will have to make this adjustment as well if they want to see the tracking. Again, don't forget to save your changes. Now when someone posts a new thread or reply in the forum, you will get a nice notification. Again, I realize that there are a few ways to get to these spots but both things are required to view forum tracking. I recently had about 200 photos that needed to be optimized for the web. That means opening the pic in Photoshop and reducing the average 3MB pic down to about 30K. It also means saving them with new file names. Photoshop can rename all the files using a convention of your choosing. OK - so 200+ pics would take several hours to re-size one at a time. UGH, who wants to do that? Not me. With Photoshop, I was able to perform this task in about 5 minutes by doing an automated batch. Basically, all you do is take one of your pictures and re-size it the way you want and record the process. Then you can have Photoshop perform the same steps on a large batch of pictures saving tons of time. My daughter who is in 6th grade was recently given an assignment to create a book about Korea chock full of facts. I happened to catch a glimpse of this book which was about 3 pieces of paper cut in half the short way, stacked, folded, and stapled together. UGH. There has to be a better way. I immediately thought of Mixbook and how that might be the perfect tool for this assignment. I showed it to my daughter and let her go to town. I think that the results were much better than what she had started. Not only does the final product stand out as an excellent piece of work but it was also a beneficial exercise for my daughter to start learning how to work with the gazillion free tools out there on the web. Here is the final product created by my daughter. It goes to show that students today seem much more well suited for working with the technology. They appear to have a natural flair for it. It is too bad that the resources are not always available in our schools so that students can use these tools more often. The official launch of my new site. I am really going for the techie look and really loved this iPhone theme. I hope to share some thoughts and ideas on k12 education, technology, tips, tricks, curriculum, and just about anything related to technology and education in general.